As I've mentioned earlier, I've changed a lot in my theory. 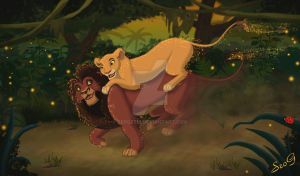 So, this guy from here, here and here is now Kiara and Kovu's son and not Nala's brother anymore. I'm glad you changed it because it looks so much better. But I like the early design of Kiara during the early production of Lion King 2, because she resembles Nala. I've always wanted to see more of Nala's features in Kiara. Saba, huh? You didn't happen to get that name from Power Rangers, did you? Nope, I just modified the name "Simba" a bit and got Saba. However, this name surely can exist in other stories or movies, or cartoons. Okay. Wasn't complaining, though. Just thought it was funny. I remember, I've created a name for one of my characters once and then it turned out to be a word with a meaning on some African language! Nice! What was the word? And what did it mean? As far as I remember, the name was "Suerti" and the word was "suerte". It was in Spanish, I guess, not in African. Unfortunately, I can't recall what it meant.